Hello, I’m Joy MacTavish, MA, IBCLC, RLC, ICCE, an International Board Certified Lactation Consultant, childbirth and newborn care educator, certified babywearing consultant, certified elimination communication coach, gentle sleep coach, and owner of Sound Beginnings. Welcoming someone into your home to assist your family during the vulnerabile postpartum period takes some amount of trust. That decision can be aided by knowing more about who you’re trusting. To that end, I wanted to share some of my history and what has drawn me to the role of a perinatal professional. In 2007, I began supporting families as a childcare provider and then a birth and postpartum doula. Two years later I joined the team at Great Starts Birth and Family Education, a Program of Parent Trust for Washington Children, as a childbirth and newborn care instructor. My formal path to become a lactation consultant began in 2011 with a community-based lactation internship with my chief mentor Dolly Smith, RN, MS, IBCLC and the Beyond Birth Seattle lactation group. I assisted at the former Breastfeeding 911: Help for Hurdles, and attended in-home lactation consultations throughout the Seattle area. To increase and round out my skills, in early 2012 I completed a hospital-based lactation internship at Sibley Memorial Hospital, Johns Hopkins Medical in Washington, D.C., where I had the privilege of spending hundreds of hours supporting new breastfeeding dyads both in-patient and out-patient under the mentorship of an amazing group of IBCLCs. In 2012-2013, I worked as the Worksite Lactation Support project coordinator for the Breastfeeding Coalition of Washington, a program of WithinReach. In this role I led a region-wide project to increase the number and type of breastfeeding-friendly employers in the Puget Sound. Through developing and implementing a worksite lactation support toolkit for employers, and providing training to regional breastfeeding coalitions, this community outreach effort ultimately benefits those who are breastfeeding and returning to work. I also found a love of supporting families with pumping and returning to work in a way that makes breastfeeding/chestfeeding sustainable. During this time, I continued my pathway to board exams through the completion of all Health Sciences Education requirements and Clinical Competencies for the Practice of IBCLCs, before sitting for and passing the international board exam in July 2013. Just 11 days after the exam, I welcomed my son into the world and began my personal breastfeeding journey. As a mama who’s experienced nursing a baby with latch challenges, posterior tongue-tie and upper lip tie, and food sensitivities, I have a personal and professional understanding of the concerns, emotions, and support necessary to overcome breastfeeding challenges. In the fall of 2013, I officially joined the non-profit parenting and lactation support organization Beyond Birth Seattle through which I enjoyed teaching, serving clients, and answering calls on the former Breastfeeding Services Line. When Beyond Birth Seattle shifted from offering community-based breastfeeding support to focusing exclusively on providing professional education I became the conference co-director and continue to serve in that capacity. In 2014, I accepted a position as adjunct faculty at the Simkin Center for Allied Birth Vocations at Bastyr University to create a Breastfeeding for Doulas online course. Through this position I feel I’ve come full circle in my perinatal career and am able to educate new doulas with my lactation related knowledge and experience. In 2016 I merged my previous companies Sound Breastfeeding and Sound Doula to create Sound Beginnings. This allowed me to expand my private practice, offer new services, and take on an intern. I am committed to the education of future IBCLCs and always appreciate when clients are willing to allow our intern to attend their in-home lactation consultations. I am passionate about continuing education and social justice. 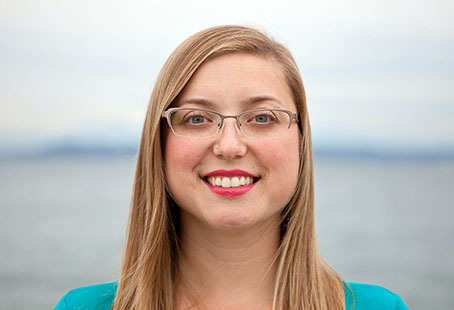 I have served on the REACHE conference board and the PALS Doulas PERC committee, and been a founding member of the LGBTQ Birth and Family Professionals, Puget Sound Perinatal Collaborative, and the Collaborative for Breastfeeding Action and Justice. I am an allied member of the National Association of Professional and Peer Lactation Supporters of Color. Outside of my perinatal work I hold a Master of Arts in Cultural Studies and graduate certificate in Gender, Women & Sexuality Studies at the University of Washington. My academic focus centered on identity, intersectionality, and anti-oppression. I enjoy bringing my research and analysis skills to my perinatal, parenting and advocacy work. My family lives in a multigenerational household in Shoreline, where we enjoy exploring the Pacific Northwest – especially parks, bookstores and libraries – visiting with family and friends, and traveling.